Share the post "Creating Simple Spring Boot Web Application Using Maven"
In this tutorial, we will show you how to create a very simple spring boot web application using maven. Spring Boot lets you create an application with minimal configurations but with the functionality of and advantages of spring framework. When creating a simple spring boot web application, spring boot eliminates the need of creating a web.xml, a dispatcher or other xml configurations. Spring Boot automatically create those configurations for you just by adding the right dependency in your maven or gradle project. This uses spring mvc, thymeleaf and of course the spring framework. This can be your based project when creating a web application in the future. First, we create a new project in IDE. We are using IntelliJ but should be the same in other IDEs. You don’t need to create a maven project using any archetype. We’ll just create the basic maven project. Next we configure the pom.xml. First, add the packaging tag to tell maven how to package your application. First, lets make this to jar. We’ll also show you how to package this into war file to be deployed in application servers. To be able for your project to work with spring boot, your project should be a child of the parent spring boot module. So we need to add the parent tag in our pom.xml and point to spring-boot-starter-parent. Then we need the spring boot starter dependencies. spring-boot-starter-web – this dependency tells spring boot that your application is a web application. This add the functionality of @Controller, @RequestMapping, etc. spring-boot-starter-thymeleaf – web app needs some views like jsp or html. Thymeleaf is a server side template engine where your htmls can be viewed in any browser. Simply to say, instead of traditional jsp with jstl or format tags, we will use thymeleaf. spring-boot-devtools – this is an optional dependency but this makes your development faster. This dependency automatically restart or hotswap your changes to the running tomcat server, thus removing the need to restart the application whenever there are changes in codes. Just like any java application, we need to define the main method in which will be the starting point. Here we create a class named Application.java with the annotation @SpringBootApplication. This will also be the file that you should run in order to start your web application. To be able to handle web request, our application should have controllers. Here is a sample controller HomeController that handles the request to the path “/”. The method viewHome() tell us that any request for path “/” will go inside this method and will return the view “index” which will be created in the next step. Thymeleaf needs 2 folder: static and templates folder inside resources folder. 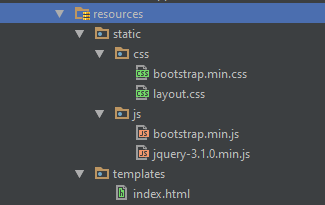 The static folder contains your static files like css, js and images. The templates folder contains the actual htmls that will be use to create the html that will be rendered on browsers. 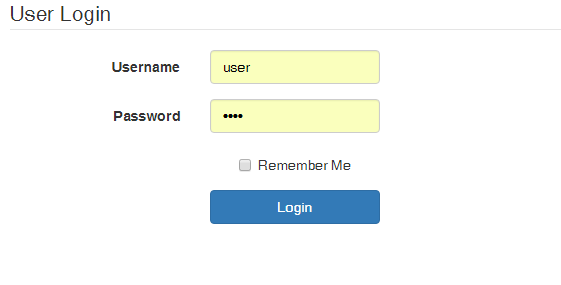 Our index.html contains a basic form login. At this time, you can already run your project without creating application.properties file. Spring will just use the default configurations for your web application. If you want to be more specific, you can create application.properties inside resources folder and define the configuration that you want to use such as the context path, port of tomcat to use and more (see Spring Boot Commong Application Properties). This tell us that the application will have a context path of “/javapointers” and tomcat port of 8085 so the final url will be localhost:8085/javapointers. Finally, we can now run our simple spring boot web application. To run, open the class Application then right click the main method and select run or debug to debug the app. This will display the spring boot banner and logs in the console. Next tutorial is about how you can Add Spring Security to Spring Boot Web Application. This was / is pretty half-assed. Put some effort into writing a tutorial if you’re going to do it.